After a lengthy R&D cycle exploring what was available from VMWare, VirtualBox, Xen, and KVM, we set out with KVM and have not looked back. Goals: virtualization infrastructure on Linux, using open-source, requiring no special guest OS provisions, with as few moving parts as possible. Result: KVM managed via Libvirt on Fedora/RHEL. 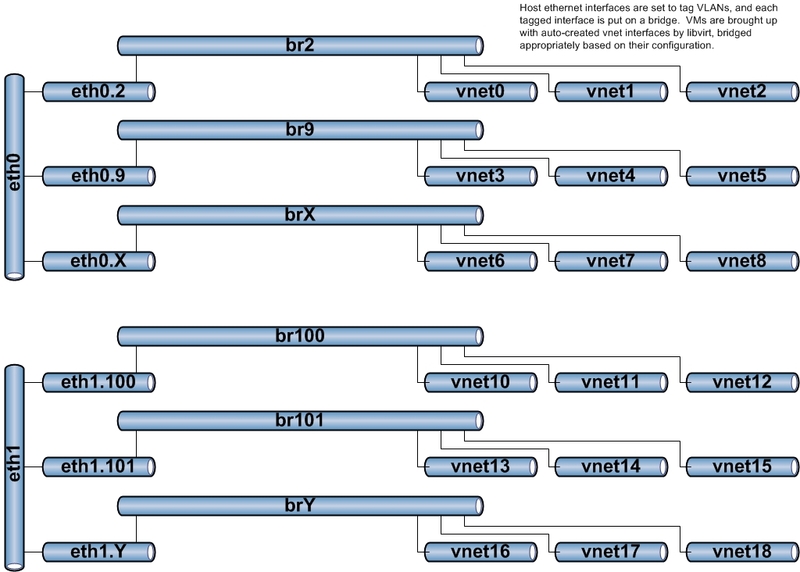 Host machines are 802.1q trunked on numerous networks, and bridges are created for each virtual NIC. Guests are brought up and placed on the bridges (networks) necessary for their function. The great benefit of a full vritualization solution such as KVM is that there are no special requirements for the guest OS. This has made life less complicated acros hundreds of Linux and Windows installations.